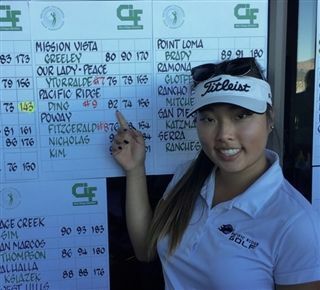 With a smooth swing and a determined mindset, junior Angela Ding played her way to an impressive 9th-place finish in this year's CIF-San Diego Girls Golf regional tournament. Her placement, among 473 female high school golfers in San Diego, resulted from a combined 82/74 score of 156 shot at Admiral Baker Golf Course on November 3rd and 5th. Angela's post-season run came to an end at the SoCal regional tournament on November 12th where she missed the cut with a round of 77. Congratulations, Angela!